We’re all familiar with the concept of movie trailers, but book trailers are becoming more common too. Like a movie trailer, a book trailer is meant to increase interest in a story. Where queries and back-cover blurbs pitch a story in writing, book trailers pitch a story by showing. Literally. 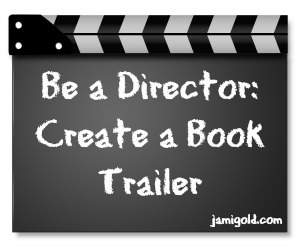 Some publishers of big name authors will spring for production of a book trailer, but the rest of us—traditionally published or self-published—have to create one on our own. Yikes! Now writers have to be mini-movie directors too? To help us, I brought in Angela Quarles, who recently had her book trailer featured on USA Today’s Happily Ever After column. Angela just released her debut novel (a story I gushed about years ago, when I discussed why I love beta reading) and is going to walk us through how she created the trailer for Must Love Breeches. Today’s post is long but filled with fantastic information. This one is definitely a “keeper.” *smile* Please welcome my beta buddy, Angela Quarles! Thank you for having me on your site, Jami! I know Jami likes to have practical writing posts that give you real tips that you can use, and I hope I can deliver that to you today as well. You’ve seen book trailers—when done right, they make you more intrigued about the book. But you’ve also seen the ones that look amateurish. I first did one a couple of years ago for the release of my novelette, but with the release of my first full-length novel, the stakes felt higher to me, and I was intimidated to try it again. But, like last time, I told myself that if I couldn’t pull it off, no one had to see it. So, what follows are my steps to making a quality book trailer. Jot down words that convey the tone the book trailer should have. It needs to match the tone of your book, of course. Brainstorm ways that you can visually achieve this. Look at other book trailers to see what they do and write down techniques and other aspects that you liked. Armed with your brainstorming notes and a pen and paper, draw rectangles and jot inside some images you could see using in each spot, along with any captions. I just did a quick and dirty one, it won’t win any art prizes, but it helped me see this as a series of ‘scenes’. I crossed things out, drew rectangles on the sides with arrows where they should be inserted, etc. Not all of the ‘scenes’ I ended up using, but it helped me visualize it. You don’t want any more than about 18-20 of these because you want to keep it under 2 minutes, but the shorter the better. The best is if you can encapsulate it in one minute. Attention spans are short, so get in, get your story and tone across, and get out. For your captions, think short and simple here. Like a log line, or your query letter. Just try and think what you want to convey, and how, and come up with the wording. Viewers will lose patience if they have to read a lot of words in a trailer. In fact, the same principles used for creating an effective logline apply here. It needs to convey genre, tone, who, where, what they want, what/who opposes them, etc. And just like your query, start with your hook! Both times I’ve done this, I didn’t do this until the end when I already had my slides made in my software and so it meant remaking parts of it, so I think it would be good to do this step here. Even though I had my captions written in my storyboard, something about it prevented me from seeing it as a whole. So I pulled out just the words, each caption on a separate line, and pasted it into a text editor like Word. This allowed me to see any gaps in logic, or ways to tighten the prose. I didn’t have time this go around, but last time I sent just the text to two friends who also took a look at it and gave helpful suggestions. Do you have repeat words? Are you saying the same thing several different ways? Trim, trim, trim! Use the same word-craft skills you apply to your WIP for here as well. I used Windows Live Movie Maker, which in other tutorials online said that it comes with Windows, but it didn’t come with mine. But it’s a free program, so you can download it here if your computer doesn’t have it either. If you’re not on Windows, I’m sure the Mac comes with a good program too. This won’t be a tutorial about the specifics involved with this software, but rather the principles involved with making one. So if you have to download, go ahead and get that ball rolling while you then browse for images… Other authors have told me they’ve used Nero in conjunction with Windows Live Movie Maker. Next you want to look for images that will work with your scenes. Be very careful here, as you don’t want to use copyrighted images. I opted to spend some money and purchase high quality photos where usage would not be a problem. Be very aware of what the license allows you to do. I found one that would’ve been perfect for showing the British Museum and was poised to buy it when I noticed it was for Editorial use only. In the end, I spent less than $50 total for all the photos and one video clip I used by going to Dreamstime. But before I purchased them, I browsed for ones I thought would work and put them in my lightbox for the project. I then downloaded samples and used those samples in my trailer until I knew for sure those were the images I wanted. And pick images that are sharp and get across what you want to convey in a nice, tight shot. Don’t get something so ‘busy’ that it’s ambiguous. You can even purchase short video clips if you want to get really fancy. There are many on iStock Photo and Dreamstime as well, like this one that shows a little sensual snippet that might work for a romance trailer. I used a clip of the inner workings of a clock to get across the time travel part and to add visual interest. Depending on how many photos you intend to use, each have different advantages with regard to pricing. I was able to find what I wanted and buy just the right amount of credits to cover my cost. Now go ahead and open your software and set up your project file. Make sure to choose your aspect ratio, and I recommend using “Widescreen 16:9” as that will look the most professional. 16:9 refers to the aspect ratio, meaning the width will be 16 units across for every 9 units down. Start making each ‘scene’ by inserting your captions and images. I didn’t do music until near the end, so that I wouldn’t keep hearing it over and over while editing (though I guess I could’ve hit mute). But the idea here is to lay down your scenes, just like you would in a rough draft of your story. You want to get them down to see what you’ve got. If you’re using still images like me, don’t let them just appear and stay there for a bit until they get replaced. Try to create interest and movement by utilizing the in-built transitions and movements that come with your software. I made sure that every time a photo appeared, I used transitions that seemed appropriate. But be careful here, there are some pretty cheesy transitions available to use, so try to keep it simple and fitting for the tone you’re aiming for. You don’t want it to look like someone who just started playing with all the cool transition tools in their new video creation software (*wink*). My advice would be to find one transition that works, and stick to that one for the whole trailer. For movement, I used some of the inbuilt panning so that the photo moved around a little. Again, don’t go crazy. Same with your captions, try to choose one of the inbuilt fade in/out movements that come with it. Stick to one font, two at the most. Like the transitions, don’t go crazy here. Make sure that the font is a professional-looking, clean, readable font, and if possible, matches the tone you’re going for. Often the wrong font can cross the trailer over into Amateur Land. I used the ones I bought that were used in my cover, but you can find fonts at places like dafont.com, Font Squirrel, My Fonts, or 1001 Fonts and download one. Like music and images, be careful that you choose one that grants you commercial license to use it; some are only for personal use. My first trailer, I put the release date in one of the frames, but this time, I opted not to, so that it didn’t get quickly dated. Insert them as is and live with whatever background color shows on either side (if it’s a vertical) or above and below (if it’s a horizontal). This has the potential of looking amateurish though. Recommended: Open up your image editing software (like PhotoShop) and if you want the whole image visible, create a file with the right aspect ratio and background color you want and place your photo centered. Or if you’re okay with parts of the photo missing, cut off part of it so it matches the aspect ratio. I prefer to do the latter so that the photo takes up the whole screen. But how do I figure out the aspect ratio?—I’m so confused! you’re probably screaming right about now. Fear not, luckily someone else has made a calculator available online. In the space that has 4 and 3 prefilled in the width and height, change that to 16 and 9. Then use the area near the bottom of the calculator to input one of the photos dimensions in pixels, hit calculate, and it tells you what the other should be. For instance, one of my photos was 849 pixels by 565 pixels. I knew I wanted to keep the width of the photo, so I input 849 in the width box at the bottom, hit calculate, and boom, it told me I needed to make the height 478. So I trimmed my photo, lopping off top and bottom, so that it had this height and RESAVED it under a new file name (that way the original photo stays intact). Don’t forget to credit those you need to at the end, like the cover artist, photos, and music. Dreamstime has specific language for photo credits. Again, don’t put copyrighted music in your trailer! So that fave tune of yours by the artist you love? Ah, no. Unless you only want your video playable from YouTube (more below). There are sites that have royalty free music you can buy, like the images, (Google ‘royalty free music’) but I was on a tight budget, so I went with the same musician I use last time: Josh Woodward. He has oodles of music on there that you can use for free, and you can filter by mood, or instrumental only, etc. If you don’t like his, you can Google “free download,” “royalty free,” “contemporary sensual music,” or whatever you’re looking for. However you find your music, be sure to follow their instructions on usage and how they should be credited. You do not want to get in trouble later. I know Kevin MacLeod is another musician who has free instrumental music you can use. Whatever it is, again it needs to match the tone of your story/trailer. Now, if you do want to use a song from a popular artist, I’m told that YouTube has agreements with some corporations like Sony, but the catch is, it can only be played on YouTube using their embed links (and you have to be sure that song is part of YouTube’s licensing agreement). This would prevent you from uploading your book trailer to Facebook, or uploading it to your Amazon Author Central page, which I think is a severe limitation. I’d rather have it accessible in several places. Just like with your WIP, get some folks you trust to look at your rough trailer. I posted it to my facebook profile (but kept the visibility restricted to Friends Only) and got feedback and also posted it to my street team for feedback. And like Beta readers with your book, they will find inconsistencies, typos, and suggestions for improvement. Now purchase your images and get them sized and imported. Don’t opt for the smallest size. Get one that is at least 640×480 and at 300 DPI. You don’t want it looking grainy if it’s blown up full screen. Again, like your WIP, do that final tighten and polish. I cut down precious seconds by just making sure the delays between scenes were exactly paced the way I wanted. If your book is being published by a publisher, make sure you follow their rules and get whatever approvals you need before you make this live. YouTube allows you to upload videos and keep them private so you can send links to those you want to see it. Step 14: Release that Puppy! Release it into the wild! I uploaded mine to YouTube, but I also arranged to have it premiere on a fellow blogger’s website. If your book is a romance, the absolute best place to have your trailer seen is on USA Today’s Happy Ever After column. My trailer was featured right before Labor Day weekend and generated a lot of hits to my site. To submit your book trailer for consideration, email Robin Covington at robin@robincovingtonromance.com. Another place to submit is to Jessica Aspen for her Whimsical Wednesday feature. If your book is Fantasy, Futuristic, Time Travel, or Paranormal Romance, then she might feature it. Submit your YouTube link on her website. If you’ve been putting chapters up on WattPad.com, they now allow you to embed video with your story. Also, be sure to upload it to your Goodreads book page, and also to your Amazon Author Central Profile. I also uploaded it to my Videos tab on my Facebook page. Annnnd, don’t be an idiot like me and not put your buy links in the YouTube description (the text part below your video)! Honest to Pete, I totally forgot to until like 4 days AFTER my book trailer was on USAToday. There’s an endless debate about whether or not a book trailer is effective, but for me, I find it so, since in our genre we have such a readily accessible and high profile venue to share it on–USAToday. For this debut author, it was the only way my book would get featured there! Keep the costs low, and what do you have to lose? Sign up for Angela’s mailing list, or find her on her website/blog, Paranormal Unbound group blog, Twitter, Facebook, and Pinterest. Holy Wow! Thank you so much for that fantastic post, Angela! I also like how we can compare the back-cover blurb above with your trailer to see what elements and tone you duplicated for your trailer. Do you enjoy watching book trailers? Have you tried making your own? Do you have any advice to add to Angela’s tips? Do you have any questions for her about her book trailer or how she did any of the steps? Hi Jami and Angela. Great post. 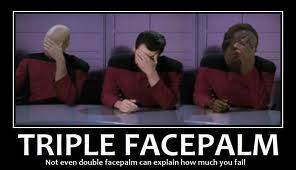 Book trailers are an area that I’ve had trouble with. I feel a bit better now, having read this. I know just what you mean! I found the whole idea intimidating before. I can see now that there are a lot of steps involved, but they’re all do-able. 🙂 Thanks for the comment! Hi Kate, thanks for your comment! I’m glad it helped make it a little less intimidating! I love your idea about how to get practice with making videos by starting with a favorite book. That could help us get comfortable with the process and know whether we want to add a book trailer to our list of things to do. But as you said, book trailers are another way to expand our reach to people who might not hear of us otherwise. 🙂 Thank you for sharing! 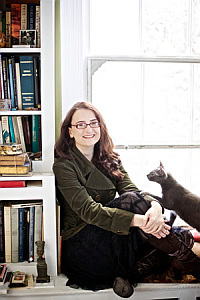 I agree, the idea of doing one for another book can be a great way to hone your skills. Especially as it can give you an idea of how to distill a story you love into such a medium; much like trying to write a logline or blurb for a favorite book can be a good exercise. Thanks for your insights! I have to say I don’t think of book trailers as a “logline” just because that paralyzes me, but maybe that’s because since video’s more directly visual than text alone, that’s what personally keeps me from being overwhelmed to just put something together. I’m definitely for doing a test run before making available en mass so you can catch typos or bad timing, especially when you’re doing videos for other’s work you really love and admire. Because my fan videos are as much to support my favorite books and their authors as much as building my name recognition in non-diva ways, I also don’t want my quality to negatively influence them or me by association. Thank you Jami for having me on here!! The only problem with this tutorial is that would never apply to me, since my characters aren’t human. XD But no matter. Great tip about DeviantART too. You’re right about how we can often find good artwork there. 🙂 Thanks for the comment! That’s what I was going to suggest too, Jami. Having non-human characters shouldn’t affect your strategy and options in making a trailer. Think mood, tone, etc., and find images to match. Thanks for the DeviantART tip, forgot to mention. Right on, Jami and Angela! It’s easy when the animals are more naturalistic (like Shiloh), once we get cartoony OR in the haze nexus of anthropomorphic and realistic which is where the bulk of my stories lie things can get complicated. I make it work, R.A., and sometimes you can doctor images to suit your needs, it just takes some work and time, it might be tougher if your book’s not a children’s book or in the paranormal space, but it can be done. I will definitely look into DeviantArt for future projects. Yay! Considering that I haven’t done a video before, I’m glad I wasn’t off about this issue. 🙂 Thanks for sharing your insights! Hmm, that does make sense. I’ll have to look into that! Angela, your book trailer is perfect! I’ve seen some that are waaaay too long and I lose interest. Yours gets to the point quickly and kept my attention. Thanks so much for this amazing information. I have iMovie on my Macbook, but I’ve never attempted to make a book trailer. I’m intimidated by the whole process. This post is a keeper. Like you, I’ve always been intimidated by the thought of making a trailer, but sometimes we just need someone to hold our hand. 🙂 Thanks for the comment! You can do it, Julie! Thanks for stopping by! I’m glad you might have gotten some help out of this. That seems an appropriate thank you for the help you give to authors by featuring their work. 🙂 Thanks for the comment! Very helpful. It’s nice read instructions from someone who knows the pitfalls. Thanks so much. Yes, I love how Angela shares not only the steps, but also the pitfalls to watch out for with each of those steps. 🙂 Thanks for the comment! Glad I could help, Sharla! I’ve never made a book trailer, but I’ve seen some great ones and think I’d like to tackle this avenue! Thank you, thank you for this fabulous resource! I know what you mean! If I can get over the intimidation aspect, this seems like it could be fun. 🙂 Thanks for the comment! You can do it, Tamara! And just like when you first sat down to write that first ever draft novel, just tell yourself no one has to see it. Great stuff, Angela! Thanks so much for sharing your experience and wisdom. Congrats on the book and the trailer! Yes, the trailer she posted proves how good we can make it look, right? 🙂 Thanks for stopping by! Book Trailer Beginnings - Kerry Gans, Author - Welcome!